These are book reviews of Dance of the Zodiac, a 8 1/2 inch by 11 inch paperback book with 86 pages and a colorful laminated cover. It is printed ON DEMAND to bookstores around the world, with printers in the USA, UK and AUSTRALIA. USA orders placed here on our website are printed in Spokane, WA. and they are personally autographed and shipped by the author William Schreib. Orders from this website bring a greater return to the author, to support his future work. “Professional and students of astrology are often asked to prove what they know by guessing someone’s Sun-Sign. The Ascendant, ruling planet or any cluster of planets in a sign can provide dominate characteristics that disguise the Sun-Sign. Still, there are astrologers who have an uncanny knack for knowing someone’s Sun-Sign. Astrologer, writer and illustrator William Schreib has chronicled the tell-tale traits that reveal the dominant sign in his second book, Dance of the Zodiac. We’re not talking only about physical traits, but also that subtle current of energy that resides within the individual. Following some introductory material about the influence of light on shaping humans and explanations of the structure of the horoscope, Schreib begins his illustrated guide to the signs and personal planets. The drawings emphasize the recognizable traits of each sign, such as the shape of the head and eyes and the essential demeanor. One sections focuses on the twelve Sun-Signs and after studying these, you’ll get an intuitive sense for what makes each sign tick. Each sign is accompanied by a collage of celebrity photos that help shape your understanding of that sign. Another section looks at the Moon signs, while the section on Ascendants completes the main three components of the recognizable traits. The poetic writing adds flare to the charming illustrations. Later chapters allow one to fine-tune the qualities that permeate the personality. Schreib is a monthly contributor to Dell HOROCOPE magazine and if you can’t get enough of his column, then you’ll love this booklet and all its celebrity snapshots. And for those who really get into the essence of what’s offered here, you’ll be able to dramatically increase your success rate when pushed to identify someone’s Sun-Sign. William Schreib is an astrologer, illustrator and writer whose column “Celebrity Snapshots,” has appeared in Dell Horoscope for 15 years. (Long-time readers of TMA may remember his cartoon contributions to the magazine in the early 1990s.) Dance of the Zodiac is a lavishly illustrated book (it has hundreds of drawing and photographs), with many insights into how the signs of the zodiac are displayed in the physiognomy– but it is even more than that. Schreib is interested in how astrology affects our personality and appearance. His book begins with the section, The Theory of Everything Seen and Unseen, in which he discusses current ideas from science and other fields (quantum physics, The Resonance Project, and the Event Horizon, etc.) as signs that are are perhaps becoming “capable of seeing how everything is just a coloring of One primary source of Light.” The view that “all physicality is a product of the angles between energy sources (light beams) and objects in space” leads naturally into sections on the basics of astrology. After the introductory material, the rest of the book is designated as Astrological Guidelines to the Visible World. The author covers the elements, modes, houses, and planets and then gives a detailed consideration of each of the signs, with an emphasis on the physical traits. There are lots and lots of photographs of celebrities, along with Schreib’s commentaries on the sign-specific distinguishing characteristics of their faces, gesture, and movements. Schreib is a close watcher of human behaviors, and he walks the reader through his careful observations of hundreds of people in the entertainment world. He also describes the appearance and behaviors for each of the decans (the 10 degree divisions) of the signs, and offers pages of examples of celebrities who share Moon signs and notables with the same Ascendant sign. The final chapter is a sampling of the “Celebrity Snapshots” columns that have appeared in Dell. These are succinct and specific essays describing how the Sun, Moon, and Ascendant signs (some with additional planets or configurations) are on display in various public lives. These reports are entertaining to read (given our cultural fascination with the seemingly glamorous lives of other people) but also insightful. The author captures many sides and nuances of how the planetary energies are expressed visibly in the human being. I don’t think there’s another book like William Schreib’s Dance of the Zodiac. It is a unique, informative, and very enjoyable treatise on recognizing “the elemental differences and the ‘universal patterns’ that created all physical form.” Those features of the signs are illustrated in the author’s extensively researched collection of celebrity faces. This book will help us to recognize these features in the faces and manner of those near and dear to us as well. When I received my copy, I was astonished!! Because it was much more than I thought. It’s not only a book that have more value than it actually cost, it is a piece of the wholly science. Christian B., Cowansville Québec, Canada. 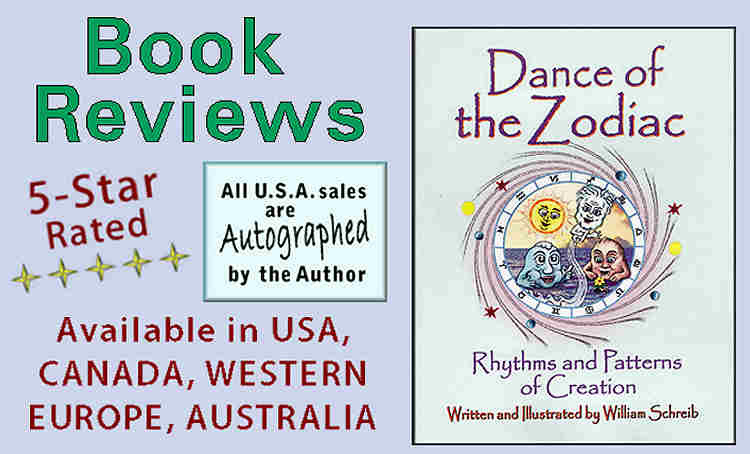 Just received my copies of your amazing books… what a dance, I love them, so does my daughter!!! Thank you for giving us this material of knowledge…truthful art beautifully done. I really enjoyed both of the books. They are very refreshing. I like the cartoon style and they are very informative. The modes are described in a way which I can really get a grip on. I’m just learning to piece the puzzles together and you’ve been a great help. I think “Dance of the Zodiac” is fantastic. There is so much information it’s incredible. When I meet people I try to guess their astrological makeup based on their physical features. I think this will accelerate my practice tenfold. Thanks! I read your books and both are fantastic! I’m happy to finally have books that show you how astrology works. I love how you talked about the sacred solids and how everything corresponds to the zodiac, how our DNA is changing and the connection to consciousness. I reference your books all the time and have it on my table and find myself looking at it all the time! I loved both books and am very thankful for having all this knowledge available for me. I loved “Dance of the Zodiac” from the opening introduction. Awesome stuff! It helped me understand how my physical body and my spiritual body work with one another. I’m always tying science in with my spirit, so the intro to this book held me rapt with its simple explanation on how quantum physics and modern sciences parallel the truths revealed in this ancient wisdom. From this beginning, this book builds its progressive lessons to put astrology back where it belongs – as a science and not in the sullied classification of “pseudoscience”. Elizabeth Seer, Tempe, AZ (Author of the book: Personalities of the Tarot). The books are good fun with an equal measure of information for the intellect. I think they are great. I love your book, William. Good analysis and you keep it positive. Fun to read and then think back on the people I knew and their faces and pictures. I’ve must say how much I’ve been enjoying the books I’ve ordered. I haven’t found any other reference that so smoothly describes the connection of the astrotheology and science. I always show anyone who would be interested in the books I have. I usually have to make sure they don’t leave my place with them. The many drawings and illustrations and photos are great; so helpful for identifying the facial features in the descriptions. I also appreciated descriptions and explanations being kept so short. I find books with long explanations are simply confusing as they have a tendency towards contradictions and conflations. Yours are KISS (keep it short & simple). You can read review on PERSONALITIES OF THE ZODIAC HERE.